On my Fedora 15 laptop, I'm almost always connected to several VPNs simultaneously. One VPN to my office or to my home (depending on where I am), one to the data center, one to a customer. These connections all have their own DNS server with their own suffix. To make all dns suffixes working, I created a script that redirects all outgoing DNS traffic to dnsmasq running on localhost, which in turn forwards all requests for .lan to 192.168.15.254 and all requests for .gl to 192.168.1.254. Once I had to fix resolv.conf manually when I connected my laptop to my Samsung Galaxy SII as well. This may mean I need to improve the script some day, but for the time being, it works good enough. Dit bericht werd geplaatst in Linux en getagged met dhcp, dns, dnsmasq, Fedora 15, NetworkManager op december 23, 2011 door David (admin). Last week I switched from ADSL to EuroDOCSIS cable. I couldn't just shut down the DSL connection as several services were still connecting to that IP. 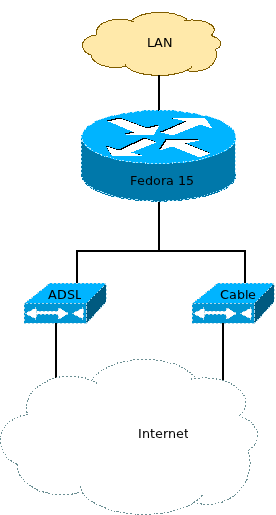 So I made my home router (Fedora 15) kind of multihomed. I haven't even taken the time to seperate the ADSL and cable modems, I just hooked them up to the same network interface. Of course, they got their own IP range. That's all. Of course, above setup only takes care of answering to incoming packets. If you want to load-balance or have a fail-over setup, I suggest you read the Linux Advanced Routing & Traffic Control HOWTO. Dit bericht werd geplaatst in IT en getagged met ADSL, Fedora 15, Linux, Multihoming, net, networking op augustus 12, 2011 door David (admin). Dit bericht werd geplaatst in IT en getagged met Fedora 15, mplayer, v4l2, webcam op juni 19, 2011 door David (admin).